The 2018 Syracuse St. Patrick’s Parade Hunger Project resulted in well-over 110,000 meals to our friends and neighbors in Central New York. Through the generosity of our Parade sponsors and direct donations to the St. Patrick Hunger Project, we have already exceeded that number of meals in 2019. Through the Food Bank of Central New York, they use our cash donations to supply our residents with fresh fruits and vegetables, resulting in a healthier diet for those in need. Thank you to all for this very successful effort. 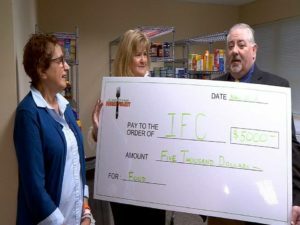 We are especially grateful for the support that made it possible for us to donate $5,000 to the Interreligious Food Consortium on November 21, 2018, when the agency was facing a shortage just before Thanksgiving. The mission of the St. Patrick Hunger Project is to help support our community network of hunger-related agencies in meeting the food needs of the individuals and families they serve. By educating Central New Yorkers about An Gorta Mor in Ireland (The Great Hunger), we hope to focus the efforts of our community on the need here to fight hunger all year, especially during the months of February and March when food supplies at the agencies are lower. During the famine years in Ireland one-million men, women, and children starved to death while resources were available that could have prevented one of the worst tragedies in history. In our own community, we have the resources to make a difference and help ensure that no individual goes hungry in Syracuse. Please join us in making Central New York better for the individuals and families who are hungry everyday by supporting the St. Patrick Hunger Project. 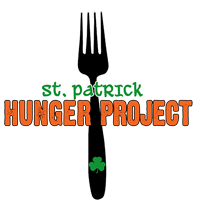 The Syracuse St. Patrick’s Parade d/b/a St. Patrick Hunger Project is a 501(c)(3) non-profit organization. Kinney Drugs. Thank you for your support! Food and monetary donations go to support local food pantries.